My father-in-law loves coconut bake. A dry coconut around the house means that my wife must make herself available to make some coconut bake for her father. I don’t give him wrong for having such minor requests, because I don’t mind myself. It is simple to make, tastes great, and it surpasses eating those extra soft shop bread that can in no way satisfy a hard working man. So you have guessed it right, not a week passes by without a coconut bake being made, as long as there is a coconut or two hanging around. It goes great with breakfast or dinner and for those who know what I’m talking about, you know what I mean when I say, that nothing beats a hot coconut bake, straight from the oven, with butter or cheese and some hot cocoa tea to wash it all down. Mmmmm!! I have seen plain bake go to waste on the counter top but never have I seen anyone refuse a good coconut bake. I am aware of two ways to make coconut bake. The first is with the coconut milk and the second is with the grated coconut kernel. 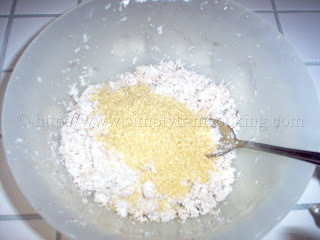 I prefer coconut bake with the grated kernel; and what will make it extra special is hand grated coconut kernel. 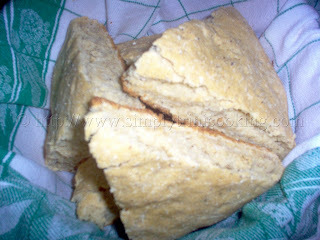 The bake is more wholesome and satisfying because of the high fibre content, so you will not have to eat much of it. Coconut bake made with coconut milk only is usually lighter and reminds me of common bread with a taste of coconut in it. This type is commonly sold by bakeries. 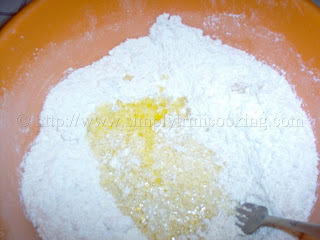 These bakeries sometimes add whole wheat flour to enhance the taste since it’s only the coconut milk being used. It tastes good, but (for me) not as good as the one with the grated coconut kernel. In this recipe, the coconut is grated by hand. A very fine meal enables easy kneading.The grated coconut also works as a good fibre; so enriched white flour could be used instead of whole wheat flour. Also, as in the case where the coconut milk is extracted and the grated kernel remains, you could use this to make coconut bake or even sweet bread. However, I would add milk to this mixture (as in the case where we saved the grated kernel from the coconut oil process). Anyway, here is my favourite, Coconut bake. Enjoy! 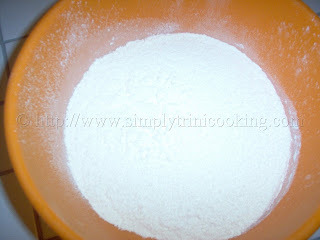 Sift flour, salt, baking powder into bowl. Add the milk and butter or oil. 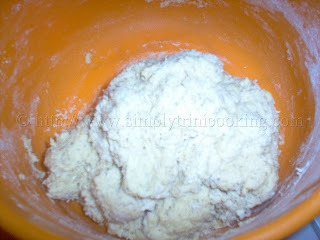 Knead for about 5 minutes or until you get a smooth dough like in the picture. 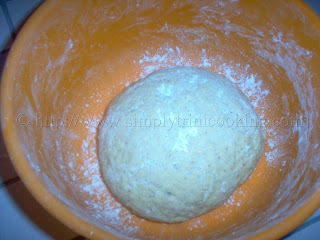 Using a rolling pin, shape dough into a circle (3/4 -1 inch thick) and place in a greased baking tin, round or square. Prick top of the bake with fork to decorate. 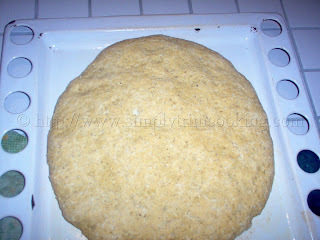 Bake in a moderate oven (about 250 degrees F ) for 20 minutes or until light brown. Allow to cool. We’ve come to the end of another delicious journey. I hope you enjoyed it as much as I did. In my upcoming post, look out for a simple rice recipe. Well I must go now. Bye!! Enjoy your coconut bake. I love coconut! This looks really yummy and quick and easy when your pressed for time but want something delicious! Yes they are really delicious! Looks delicious! And so easy to make. And we have lots of coconut here…. I took the same mixture, I added raisins, walnuts, and dried cranberries, and I cut the dough in two (2) balls, and I cut each ball of dough in biscotti shape biscuits, and I baked it for 60mins. at 250 degrees, and they taste delicious. Thanks for this recipe, and all your recipes. I enjoy all of them!!!! I used this recipe and it turned out to be the best coconut bake i’ve ever made, and tasted! Thank you so much! Thank you Swann for that wonderful comment, do visit again. i am searching for a recipe to make for my mother in law after reading all these comments i am going to try this one. besides it looks absolutely scrumptious. I recently made coconut bake with the coconut milk and it tasted like plain bake….. I was told if I used the kernel then people would not be able to eat the bake because of the amount of kernel….. Is this true???? cause I really need to eat a good coconut bake….. If you try any, let us know how it went. Yummy, I tried this recipe this morning and it was an absolute hit. Thank you for unselfishly sharing your recipes. Loved it! 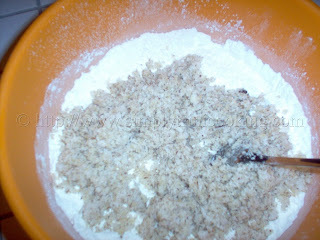 I tried the recipe this afternoon added a little grated nutmeg like my granny used to do. Delicious! Thanks Felix! This is an excellent recipe!!! The best coconut bake I’ve ever had. I only made one modification, I used 1/2 cup of milk & 1/4 cup of coconut milk instead of the 3/4 cup of milk the recipe called for. I enjoyed my coconut bake with some butter & Trinidad cheddar cheese & a cup of hot chocolate!!!! Love this recipe so much. We cook callaloo almost every Sunday with grated coconut milk and I always was so sad to just throw the kernel away. Now I just reuse the coconut kernel and add some of the milk left over from the callaloo! Delicious!!! 250 degrees F is just a ball park average that’s why I included “until light brown”. Different ovens heat up differently so you have to know your oven. When I use different sized ovens this is something I have to be aware of. Thank you Felix!! You’ve taught me how to make pastelle, callaloo, cassava pone, Christmas rice, sweet bread, sponge cake and many more and of course this delicious coconut bake that I’m going to enjoy this morning! Its in the oven! 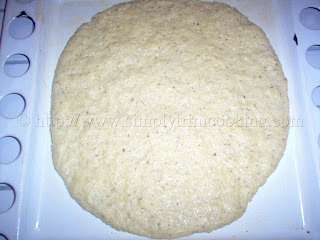 I added a little yeast because I found it wasn’t rising as much as I wanted, with the baking powder alone. Thank so much for selflessly sharing your recipes and your stories, they’re an added bonus! I tell everybody about your website, keep being AMAZING!! Can a stand mixer be using to knead this? Please let me know your thoughts and recommendations for kneading time. Thanks .